The petition was signed by 106 lawmakers, including Arab MKs. President Peres: I'll pass it on to President Obama. 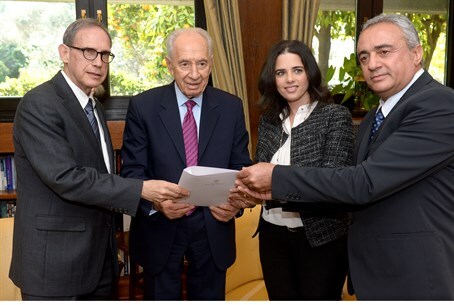 MKs Ayelet Shaked (Jewish Home) and Nahman Shai (Labor) presented President Shimon Peres on Wednesday with a parliamentary petition signed thus far by 106 MKs, calling for the release of Jonathan Pollard. Pollard has been languishing in US jails for over 28 years after being convicted of passing classified information to Israel. Peres said he would pass on the petition to US President Barack Obama. White House spokespeople denied reports that US Secretary of State John Kerry has offered to release longtime prisoner Jonathan Pollard, Yediot Aharonot reported Sunday.